When you look at the story of Mass Effect: Andromeda and its protagonist Ryder there’s something vaguely allegorical about it. The game follows the Andromeda Initiative, a group of intrepid explorers who leave the familiarity of the Milky Way galaxy and travel for more than 600 years to find a new home and hope for their people in the Heleus Cluster. When the explorers get there, things don’t quite work out as planned: there are unexpected enemies out for their blood, entire arks of explorers are missing, and the golden worlds they’d identified to settle on before leaving the Milky Way aren’t quite as habitable as they thought. Your character, Ryder, takes up the mammoth task of Pathfinder, a person tasked with finding planets with the potential for habitation and making that a reality. This is a role with a lot of responsibility at the best of times but when everything is going wrong, expectations and demands weigh even heavier. You probably get where we’re going with this. Ambitious plans with lots of variables that carry the expectations of lots of people are very rarely executed perfectly. It's what happens with the Andromeda Initiative and it’s what’s happened to Mass Effect: Andromeda itself. The residents of the Milky Way galaxy looked at Andromeda, plotted their path and settled on their final destinations but in the 600 years it took them to get there things changed. You almost get the sense that BioWare surveyed the landscape following the the launch of Mass Effect 3, plotted a course of action and didn’t really account for how much the RPG landscape would change in the long period of development. As a case in point, the first few hours of Mass Effect: Andromeda are something of a slog. 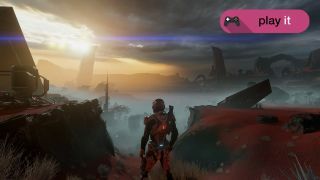 The game world is huge, bigger than anything we’ve seen from Mass Effect before, and it’s beautiful too. The planets you’re able to explore are diverse and interesting and it’s honestly not possible to traverse them in their entirety without using your vehicle, the Nomad. They’re also densely populated with quests and tasks. It really feels like almost every person and item you interact with presents you with something else to do. This is a strength and weakness for the game. On the one hand it makes Mass Effect: Andromeda a game which truly gives you a choice in how you want to play. Every time you pick up the controller you can do something different and even after finishing the main quest we’ve still got a lot more things to do. If you’re looking for good value when it comes to hours of play, you’re going to find it here. While the scale is positive, it ends up making the game so big it completely loses its pace, leaving its player without a sense of purpose. Mass Effect games really need good pacing and a tightly woven narrative if they want to get players through the main quest and keep them invested in steadily progressing character relationships. In Andromeda we often found ourselves straying so far from our initial path that it was hard to get back on track. Very quickly you’ll find yourself with so many possible threads to pull that it’s hard to prioritize. Even though every area you visit has a purpose, it’s hard to know exactly what this is and the amount of choice ends up feeling more overwhelming than freeing. So often we found ourselves slogging through parts of the game to find the good bits. There really are good bits, too, it’s just unfortunate that the paths between them are as long as the transition animation that's forced upon you when you travel between planets. It’s exhausting and you really don’t feel capable of being a great Pathfinder when you can’t even plot your way through your own journey. To make the most of the game at first you have to put your blinkers on, get deep into the main story and try to avoid becoming overburdened by side quests. It seems a shame that to really enjoy Mass Effect: Andromeda you have to repress the exploratory spirit it encourages. It’s also annoying because it’s by exploring the game’s computer terminals and email systems that you’ll find some of its best writing. It’s where you’ll find some of the best and most believable character interaction as well as nice touches of lore and world building. You sometimes get the sense that, like a child with access to boxes of chocolates before Christmas dinner, BioWare has filled up on empty side quest content and didn’t leave enough room to tell its main story. For example, in the first hour or so of the game you’re taken through the emotional wringer and given the role of Pathfinder, a title which brings you a great deal of respect. Frustratingly, you won’t really understand what’s so damn special about being a Pathfinder until you delve into the game’s codex and read the definition of what it is. This wouldn’t be so bad if going into the game’s menus weren't such an exercise in frustration. Mass Effect: Andromeda’s UI is overburdened and difficult to navigate. Here, BioWare may have had a chance to make the number of quests available less overwhelming but instead it just made them even harder to track. As an example, at one point one of our crewmates Liam asked us to do something for him - and we decided to prioritize this task for now, thinking it should be as simple as going into a quest list and selecting that specific quest. Unfortunately it wasn't quite that simple, because this part of the menu is subcategory city. Is his task in the relationship section? Maybe it’s an additional quest. Or is it a location-specific Tempest quest? No matter how much we accessed this menu, we always found the quest we were looking for in the last place we looked along with the final fraying strands of our patience. This is a small part of a much larger problem Mass Effect: Andromeda has – it’s just too much. Aside from keeping track of your quests, it also asks you to scan almost everything in sight, keep track of three kinds of research points to craft weapons and armour, skill points, planet viability points, your experience level, your character profile and finally manage an inventory that fills up quickly with the vast amount of raw materials you need for crafting. Crafting in particular has a fairly steep learning curve that doesn’t feel especially rewarding. Thankfully we found you really don’t need to worry too much about the system to find good weapons and armour – they’re littered already fully crafted around the game world. It really feels like BioWare has put a lot of time into developing a deep crafting system but it ended up being one of the first things we dropped just to stop ourselves feeling like we were drowning in numbers. Fortunately, Mass Effect: Andromeda does strip things back in other areas, namely combat. In the past you had to keep track of your squadmates on the battlefield, strategically direct them and make sure you’re leveling them up but this is no longer necessary in Andromeda. Instead, your squadmates act of their own accord which is pleasant in the sense that you don’t have to think twice about them but annoying in the sense that their AI seems to be programmed to ‘sugar high’. Stripping back this squad-management will definitely disappoint those that enjoyed it from previous Mass Effect games, but Andromeda benefits from it as it allows it to ditch the restrictive class system and give the player greater control over their own combat style with changeable profiles. Combat is also made more light and less tactical by the addition of the jet pack and intuitive cover system. It brings verticality to combat by allowing you to take the higher ground and makes Ryder’s movements on the battlefield feel much more fluid. Flitting from wall to wall while stringing together power combos and gunfire is, admittedly, slightly mindless but also enjoyable. It’s not all fighting and exploring. As you’d expect, Mass Effect has a lot of relationship building and it’s in the quiet and personal moments of one-on-one conversations that the Mass Effect series usually shines. In Andromeda, the dialogue system has changed from the simple Paragon and Renegade options to a multiple choice dialogue wheel where choices are based on the tone you want to convey. It’s no longer a case of ‘good’ or ‘bad’ and though this makes conversations more difficult to navigate it also makes the characters you’re interacting with feel more complex and less open to manipulation. With this system it’s going to be hard to get everyone to like you but that’s enjoyably true-to-life. It also underlines more effectively the moral complexity of the Andromeda mission which is fortunately explored the further you get into the game. The more you get into the game and the more characters develop, the more you’ll appreciate this new dialogue wheel. It’s a slow burning feature that does come into its own and encourages investment in character relationships. It makes it possible for you to feel like you’re developing platonic friendships as well as laying the groundwork for romance. More than any other Mass Effect game, this new dialogue system creates a sense that there’s more than one kind of ‘love’ and feelings aren’t binary. We have admittedly seen more satisfying systems in other games and the new feature is sometimes hindered by inconsistent voice acting, occasional hiccups in facial animations and a script which often just has characters tell us their personalities rather than show them. In spite of this, getting to know Mass Effect: Andromeda’s new cast of characters has been for the most part enjoyable. They were always going to have an uphill battle with someone that can’t help but compare them to the characters from the original trilogy but playing for a good while now we’re warming to them a lot more. Each and every one of them has a personal story that’s worth unraveling and though we’re definitely not as invested in some of the crew as much as others, that’s another true-to-life relationship feature of the game. Like those in the Andromeda Initiative, Mass Effect: Andromeda has come into a new console generation looking for a fresh start and to forge a new home. Unfortunately, also like its cast of characters it’s brought some baggage and some seriously heavy expectations along with it hammering home that, really, there’s no such thing as a fresh start. You can't abandon your history entirely, after all. However, though it’s not a great start it’s a more than decent one and Andromeda has laid strong enough foundations for future games in the franchise to build and grow from. Eos wasn’t built in a day and franchise reboots aren’t established in a single game. Mass Effect: Andromeda was reviewed on the PS4.